So you have a set of handles and just screw bolts in them, and put plates between handle and bolts? Quite simple design. Set of handles, a pair of bolts and a set of plates is all that you need. You can adjust weight. I’ve seen you have several methods of making kettlebells heavier on your livejournal. Tell us more. You can make them adjustable with small dumbbells. Put small ropes on them. When you use such adjustments, it’s very quick. This way the weight isn’t fixed. [The way you can make fixed adjustments you can read here] Look at photo below. That’s a pair of 45 kg kettlebells. Hanging dumbbells should be in position like the one you see on photo. There is one rule. When you hang a dumbbell on a kettlebell it should be perpendicular to the handle. It’s important. It should NOT hang parallel to the handle. This way of making kettlebells heavier is the quickest. It’s even quicker than adjusting plates on barbell. Other important thing is that you don’t need to buy the whole set of kettlebells. You need just basic kettlebells and a set of dumbbells with ropes. You can easily adjust your 32 kg kettlebells to 42 kg in double work. 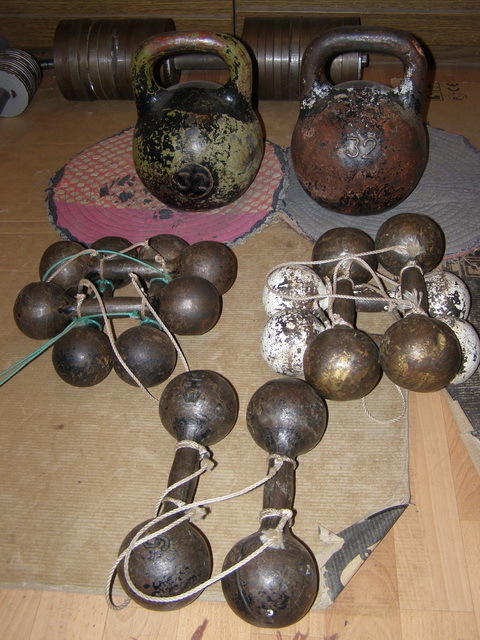 But I had problems with cleaning two 48 kg kettlebells made such way. I’ve seen you modified your sport-style 16 kg kettlebells with lead. Can you tell the story? I had such situation. 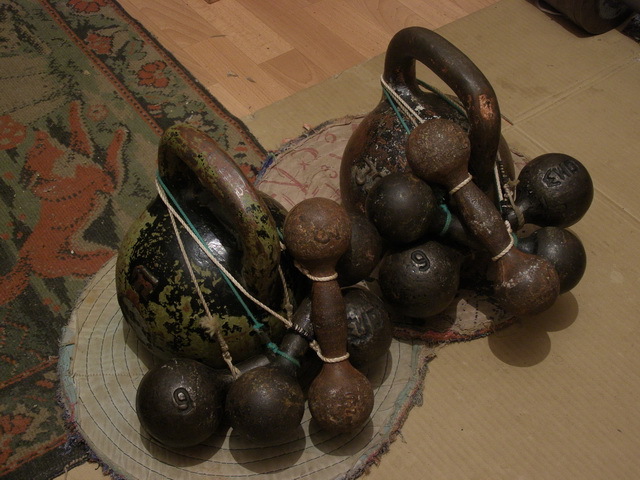 One kettlebell became 46 kg and the second – 46.7 kg. Both are less than 48 kg. I placed a 2.4 kg plate on the bottom of one and 1.25 kg plate to another. That’s how I have 48 kg kettlebells. What exercise with kettlebells is beneficial in your opinion, except military presses, push presses, cleans? Double Front Squats. Very hard exercise. Practice this exercise at least once a week. Kettlebell Double Front Squat is as hard as Kettlebell Double Military Press. Do you perform any grip work? No, not at all. Too much grip work, in my opinion, kills desire to show results in basic exercises like military press. And what’s more important: good grip or good military press? I think the answer is obvious. For me it’s military press. You can power up your grip in months, but you can’t make your military press stronger in such time. There’s a problem with military press. It’s better to train military press with different assistance exercises like push presses, bench presses than with heavy military presses. It’s the feature of this exercise. You need to push press heavy kettlebell. Approximately 10 kg heavier than you press. If you military press a pair of 36 kg kettlebells, then you need to push press 44-48 kg kettlebell with one arm. Use schemes like 5×5 or 8×5. Muscles that are responsible for lockout work in push press. It’s common that people can make kettlebell moving, but come to sticking point. That’s when push press can help you. Work with your pressing arm from start to end. Also kettlebell bench press can assist your military press development. How frequent do you train? Usually 3 times a week. Thanks for the interview. It was very interesting and thought provoking.